A highly respected panel of 6 speakers, including asset managers, analysts and even a finance professor, had 8 minutes to sway our audience on where they thought the gold market was going. Was it time to buy or don't be fooled? 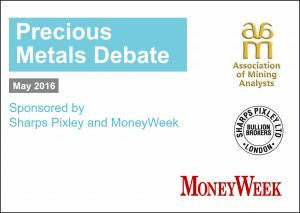 A straw pole at the start of the debate suggested that the audience were already stocked up with precious metals investments, as there was an overwhelming view in favour of gold rising by the end of the year. However, despite many valid points made by the bear argument, it was not enough to sway the audience, as few opinions were changed by the end of the evening. The quote of the evening was: "In 1987 Reagan declared; 'Tear down this wall!' This was the start of one of the worlds longest gold bear markets. At the beginning of 2016, Trumped declared; 'We will build a wall!' Since then, we have seen 20% rise in gold." In the past 3 years, the gold Bulls have consistently offered the strongest argument in these debates. However, it is the Bears who have been the smug winners as the market proved them right. We will have to wait and see whether their track record continues. Presentation slides - please note these are only available to members of the Association. Login or subscribe to view.